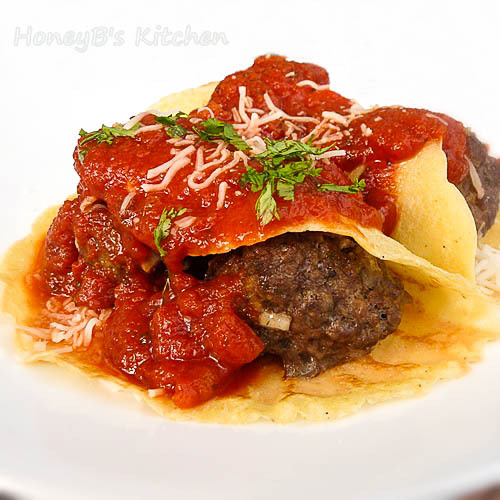 Meatballs enrobed in a thin crepe covered in your favorite pasta sauce and cheese. 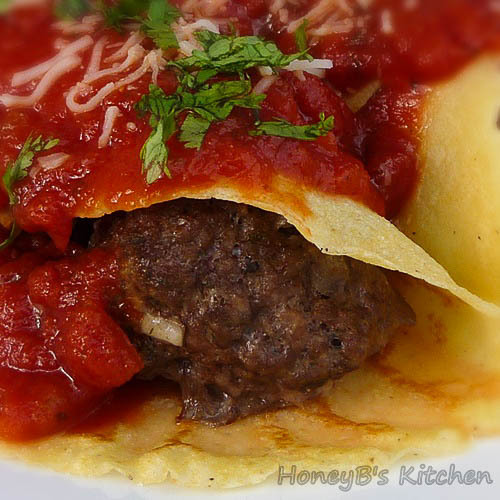 Meatball Crepes are something you and your kids will both enjoy! Have you ever heard of Meatball Crepes? I know I hadn’t until I arrived at my brother’s home and my nephew said he would make them for our dinner one night while I was visiting. He took a class on a cruise they went on last year and learned how to flip the crepe in the pan. I was definitely game on for his cooking one night. I was thinking “how cool, I’ve cooked with my brother in the kitchen, and now I get to cook with my nephew!” What fun we had too! We had a few crepes hit the floor and the laugh that gave my mother was priceless! I think I never took so many photos of one thing in my life – or maybe my mom took more than I did! I know we were really having a lot of fun and were excited that Austin wanted to cook! 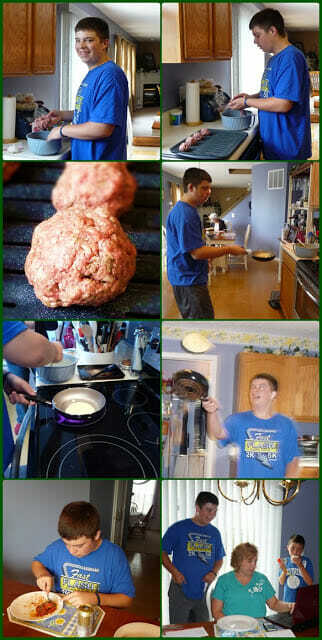 Below is a progression of his making the meatballs and crepes. Once all the crepes were made and it was time to assemble, I had Austin assemble his plate for me to photograph. He did a pretty darn good job with the presentation too! Now, how did they taste? Excellent! He did a great job all around and I actually tried something I had never heard of and now am excited to share it with you! Stay tuned for the dessert crepes – they required a little more help from me, but they turned out awesome too! Preheat oven to 355 degrees. In large bowl, mix together beef, onion, garlic, herbs, breadcrumbs, and egg until combined. Add a generous pinch of salt and pepper. Using an ice cream scoop, portion out the meatballs into round balls. Bake meatballs until cooked through (15-20 minutes). Mix dry ingredients. Combine wet and dry ingredients in a food processor until smooth. (we did this the old fashioned way – by hand with a whisk!). Spray small non stick pan with cooking spray. Pour enough batter to make a thin layer when the pan is swirled. Cook for minute on each side, or until golden brown. Put on a plate to cool until they are ready to be filled. Place two meatballs in a line down the middle of the crepe (see recipe below), drizzle a little pasta sauce on top of the meatballs, roll the crepe and top with more mozzarella cheese and sauce. I've never had crapes with meat before. What a great idea, and that looks amazing. Nice job Austin these look fabulous Shelby! Delcious! Who needs pasta when you can just have crepes, especially when someone else makes them! Great photos! What an interesting take on a savory crepe. Sounds delicious! These were fabulous, We made them with Turkey, with rosemary and sage and I fried garlic slices. YUM! Great idea and I loved your cook. Ooo meat crepes?!? I've seen breakfast crepes that were savory, but never meatballs. Very cool! I bet these are delicious. Whoop whoop and cooking with kids (even big kids) is my favorite thing to do! Just love the idea of these… EXCELLENT post! I served it with a dollop of sour cream, sliced scallions, and a side of creamy herbed mash. A family hit!!! !